Even though it is very interesting to compare the efficiency of the managers in different leagues at a certain point in a season, to the best of my knowledge, it has not been done. The reason is that to calculate an efficiency index, a frontier has to be estimated and obviously it does not make sense to mix coaches from different leagues. Thus, there are several papers (e.g., Dawson et al. 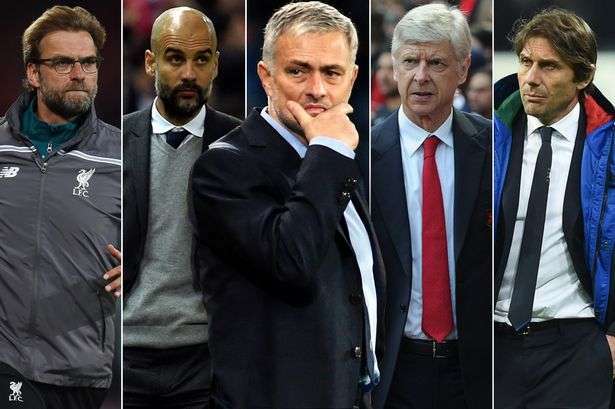 2000) that have analyzed managers’ efficiency within the same league but none has constructed a ranking of managers’ efficiency across different leagues at the same time. I propose to do this by using betting odds. Odds for football matches offered in the betting market can be reconverted into probabilities for each possible result (home win, draw, away win). If the betting market were efficient, these probabilities would reflect the true probabilities of each event. Although there is no consensus in the literature whether or not betting odds are efficient, it seems that any inefficiency that arises is very small. Thus, the probabilities embedded in betting odds can be seen as true probabilities. The European domestic football leagues are generally organized on a double round robin basis, where each team plays against the other teams once at home and once away. Winning teams are awarded three points, a draw earns one point for each team, and the losing team earns no points. The final league ranking is made on the basis of points earned at the end of the double round robin. Football Perspectives tells us about the Basic probability theory and the joint probability of two independent events (e.g., a victory of the same team in two different football matches) equals the product of their probabilities. Using this simple formula for all possible combinations of match results of each team, the probability of each team within a league obtaining a certain amount of points can be computed, that is, the density function of total points at the end of the season. The total points ranges between zero (i.e., the team loses all matches) and the product of the number of matches and three (i.e., the team wins all matches). In particular, we use the betting odds from CODERE APUESTAS in order to calculate the density functions for the 2011-12 season for the big European football leagues (England, France, Italy, Germany and Spain). The cumulative density function can be used to calculate the probability of getting more points than the actual result. The inverse of that probability can be viewed as an efficiency index for the teams in the sense than the closer the value to one will reflect a better performance and the closer the value to zero will reflect a worse performance. The teams with higher efficiencies would be the teams that have over performed in comparison with the results expected from the odds. This over performance could be due to luck or favorable referees’ decisions, but the most plausible reason to out perform the expected results from the odds is good coaching. In the same way, the under performance of some teams could be due to injuries or bad luck, but the most plausible explanation is bad coaching. Thus, the efficiency index can be understood as a measure of the performance of managers. The table above shows the efficiencies for the teams in the main European leagues (Liga BBVA, Serie A, Bundesliga, Premier League y Ligue 1) in descending order, calculated as explained above. The top team is Montpellier (managed by René Girard), followed by Newcastle United (Alan Pardew), Borussia Dormund (Jürgen Klopp) and Real Madrid (Jose Mourinho). At the other extreme, the worst teams in terms of efficiency were Liverpool, Olympique de Marseille, F.C. Kaiserslautern and A.C. Cesena.